A bit on the side anyone? Week 39 - A bit on the side anyone? A big thank you to Alex Mitchell for the great article she’s written in the Homes & Property section of the Evening Standard. According to Alex I’m the ‘go-to-man’ when it comes to transforming tight London spaces (with green walls). Honestly, I’m flattered. Week 26 - Half way through the year We’re half way through the year and what a year it is proving to be. I don’t think my little gardening blog is a place for discussing the more significant events that are occurring on what seems like a weekly basis at the moment, but I do want to express my sadness for my fellow Londoners effected by the recent tragic fire at Grenfell tower. Donate here if you so wish. We’re very pleased here at The Landscape Architect to see that we’ve been given a full page in the latest issue of the ELLE Decoration Directory. 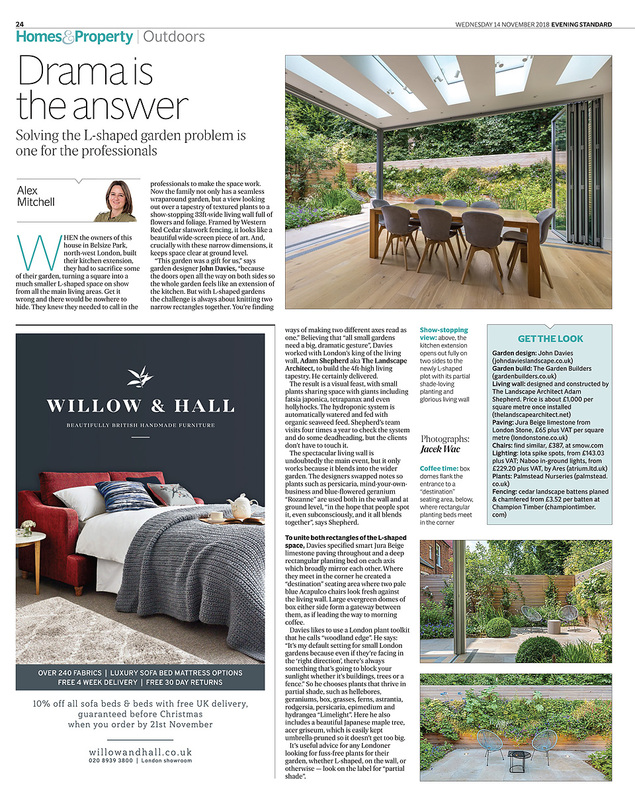 Being one of the only landscape specialists to be included in a guide to Britain’s best architects and interior designers is a great achievement for us. It is also nice to see that our new office buddies, Cassion Castle Architects, made the cut as well. Thanks again to all in the editorial team at Elle for their continued support! The Landscape Architect has made it into a book for the first time. We are very excited! Garden Design Close Up is a goldmine of inspiration for anyone wanting to give their garden a contemporary makeover. Showcasing 100 exceptional gardens from around the globe, this profusely illustrated book examines the key features of each design in close-up, photographic detail. With creations by leading British and international landscape architects, such as Dan Pearson, Anthony Paul and Martha Schwartz, Garden Design Close Up will delight all those who enjoy gardens, providing a detailed resource filled with creative ideas and practical advice from award-winning writer and designer Emma Reuss. Another month, another magazine. Following on from articles in Elle Decoration in June and LivingEtc in July, the September issue of Homes & Gardens features a piece on a lovely little garden we created last summer. We’re not really sure how long our luck’s going to last, but we’re happy whilst it does. The living wall we designed and installed as part of our hackney roof garden is still looking good, especially in print in this months issue of ‘Living etc’… blooming marvellous indeed! Everyone here at TLA would like to thank Jackie Daly, the new ‘Homes’ Editor at Elle Decoration, for writing such a fantastic piece in the July issue. The article, about the roof garden we created in Hackney back in 2009, looks great but reads even better, so once again, a huge thank you. As most of our gardens are for private clients, it’s rare we get any feedback from a wider audience, so if you feel like popping out and getting yourself a copy, then it would be great if you could let us know what you think. We look forward to hearing from you. Over the weekend Adam came across this article by Lucy Masters. He has not stopped talking about it all week. There is so much to disagree with and some of the ranting is really quite amusing. One thing is for sure though, we are convinced that living green walls and roof gardens need to be a central part of the urban garden future. After all, as housing density increases further the only solution for maintaining a decent proportion of green space is to move vertically! The fact that they also look stunning is an added benefit as can be seen in the example below taken from a garden we designed and installed in Lewis. Today we are delighted to have been awarded one of the Top Ten Garden Designs of 2011 by The Society Of Garden Designers. Each year the Garden Design Journal selects what they consider to be the 'very best examples of innovation, creativity and talent in garden design'. This year a record 61 entries were received for their Review of the Year and we are very pleased to say that one of our designs, a garden in Belsize Park, London, has been included in the 2011 top ten. Please see the article below.